Build your own LEGO® BrickHeadz version of Rey as seen in the blockbuster Star Wars: The Last Jedi movie. Check out her decorated eyes, iconic robe and Lightsaber. Then battle the dark side in a galaxy far, far away or just display her on the baseplate for all your friends to see. 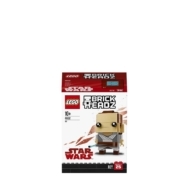 - Buildable LEGO® BrickHeadz construction character featuring Rey has authentic details from the blockbuster Star Wars: The Last Jedi movie, including iconic costume and a detachable Lightsaber. - Each LEGO® BrickHeadz construction character comes with its own buildable collector's baseplate featuring the BrickHeadz icon. 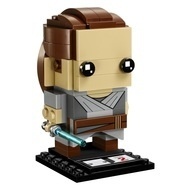 - Have fun growing your LEGO® BrickHeadz collection with other characters from the Star Wars movie saga, including 41603 Kylo Ren™, and many more of your favorite Star Wars characters. - Mash up your LEGO® BrickHeadz construction characters to create supercool hybrids or your own amazing characters. - Stands over 2” (7cm) tall without baseplate. - Baseplate measures over 1” (4cm) square and under 1” (1cm) high.